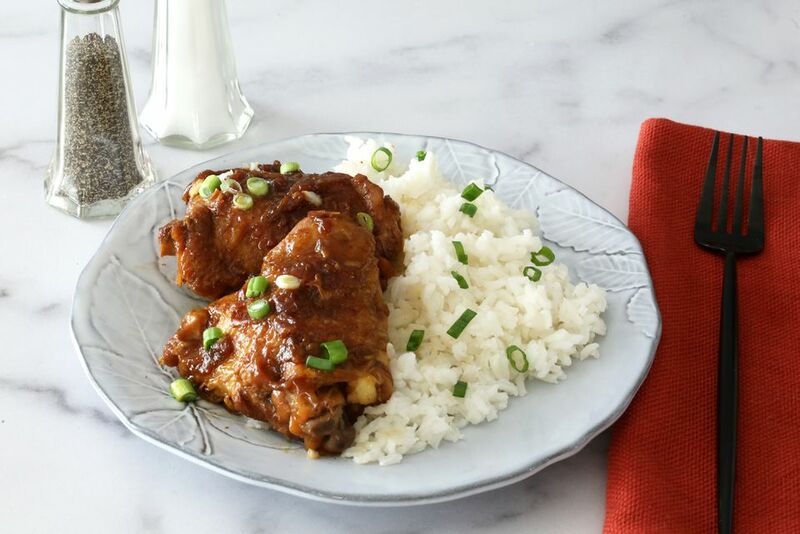 Instant Pot chicken adobo is an amazing entrée that should be part of every family's mealtime lineup. Once you taste this delicious Filipino dish, you'll make it again and again. It's easy to make on a budget, too! Adobo is, by far, one of the Philippine's most famous dishes. Filipino adobo can be made with meat or seafood, and is cooked in a full-flavored sauce made with everyday pantry ingredients—the key to its remarkable flavors. If you have chicken, vinegar, soy sauce, garlic, and an onion, you can make this delicious adobo dish. This pressure cooker version of Filipino adobo is made with chicken thighs, though whole chicken legs or a cut-up chicken may be substituted. If you don't have an Instant Pot, any pressure cooker may be used; just make sure to follow the manufacturer's instructions for liquids and release. Pat the chicken thighs dry with paper towels. Choose the highest sauté function, and add the vegetable oil to the Instant Pot. Let the oil heat for about 8 to 10 minutes. When the oil is hot but not smoking, add half the chicken thighs to the pan, skin side-down. Cook for about 4 to 5 minutes, or until the skin is well-browned. Flip thighs over and cook for 2 minutes longer. Remove the chicken to a plate, and repeat with the remaining chicken thighs. Alternatively, the chicken may be browned in a large skillet on the stovetop before adding to the Instant Pot. Pour off the excess fat, and arrange the browned chicken thighs in the pot. Peel the onion and slice it in half lengthwise, then thinly slice the halves. Press or mash the garlic. Sprinkle the onion and garlic over the chicken pieces. Combine the soy sauce, vinegar, sugar, and pepper, and pour the mixture over the chicken. Tuck the bay leaves around the chicken. Lock the lid in place and make sure the steam release valve is in the sealing position. Choose the manual setting (or pressure cook button), high pressure, and set the time to 8 minutes. When the time is up, carefully move the steam release valve to the venting position using the long handle of a wooden spoon or another utensil—the steam is hot! Remove the lid and cancel the cooking mode. Choose the normal sauté setting and continue to cook, uncovered, for about 15 minutes, or until the sauce is dark and concentrated. Serve the chicken with hot steamed rice or noodles. Garnish with sliced green onions, if desired. Marinated chicken adobo: Combine the sauce ingredients—soy sauce, vinegar, sugar, and pepper—in a nonreactive container or food storage bag. Add the chicken and coat thoroughly. Cover the container or seal the bag, and refrigerate the chicken and marinade for 1 to 2 hours or overnight. Remove the chicken pieces from the marinade mixture; reserve the marinade and pat the chicken thighs with paper towels to dry. Brown the chicken in hot oil following the recipe instructions. Add the sliced onions, garlic, and reserved marinade along with the bay leaves, and cook as directed.